Proliferation of smuggled cosmetic products and mushrooming unregulated beauty parlours show up the ugly side of this business. A visit to a salon left Indrani Subasinghe's face disfigured and blotchy with ugly burnt red spots-a severe allergic reaction to a beauty product. This was not the first time she had gone for a clean up, but this was the first time she faced such an ordeal. Speaking to the Sunday Times, Ms. Subasinghe, an employee of a state institution in Colombo said, "I had to seek treatment at Kalubowila Hospital and it was traumatic as I did not have the courage to face my family, friends or office colleagues". In another case, Shenali (name changed) was recommended a Chinese face-whitening cream by a beautician. The end result was a swollen face full of burnt patches. According to the Cosmetic Devices and Drug Authority (CDDRA), the product was a smuggled one and not imported through a registered agent. The CDDRA is the sole body that regulates cosmetics that are imported and manufactured in the country. It conducts regular raids and routine checks on smuggled and counterfeit cosmetics. All cosmetics whether they be lipsticks, skin lotions, shampoos, hair dyes etc. have to be registered with the authority. CDDRA director Hemantha Beneragama said any cosmetics that are imported or manufactured in the country has to be registered with the authority to ensure safety and quality, but smuggled and counterfeit cosmetics were entering the market and being used by beauticians. He said cosmetics that are imported by agents are evaluated by a committee comprising consultant dermatologists, toxichologists, representatives from the Government Analyst's Department and the Sri Lanka Standards Institution. "We conduct raids and inspection but the shortage of Food and Drug Inspectors has hindered our market surveillance," he said. According to the Cosmetic, Devices and Drugs Act of 1980 those authorized to conduct raids and inspections are Provincial Directors of Health Services (PDHS), Regional Directors of Health (RDHS), Medical Officers of Health (MOH)'s and Food and Drug Inspectors (FDIs). The Sunday Times learns there are around 50 people involved in this task islandwide but of them a majority are involved in administrative work. Only Food and Drug Inspectors conduct ground level inspections. However, most of the FDIs are involved in carrying out inspections and raids on food and pharmaceuticals leaving only a few to inspect cosmetics, he said. "We have requested an increase in the cadre especially for inspection and raids," he said adding that the lack of officers to inspect baggage at entry points to the country have made it easier to smuggle cosmetics into the country. The smuggled cosmetics are mainly from India, Thailand, China, West Asian countries and Indonesia. Dr. Beneragama said in the light of an increase in smuggled cosmetics and counterfeits the authority held discussions on safety and quality of cosmetics with local cosmetics manufacturers and representatives of beauticians' associations. He said steps are to be taken to regulate beauty parlours and products used at these parlours also being inspected. According to the country's Professional Hair Dressers and Beauticians' Association (PHABA) there are over 5,000 hairdressing and beauty salons in Sri Lanka with thousands entering the industry annually. He said, the public can complain to the authority about unregistered products or if they have a bad reaction to a particular product. Once the complaints are lodged, samples are sent to the Industrial Technology Institute or the Sri Lanka Standards Institution for lab tests and if the goods are found to be counterfeit or harmful, legal action would be taken against the beautician or the trader. The public can lodge complaints by calling 2676498, he said. Last year only 11 complaints were reported from Colombo and eight from other areas, he said. According to a senior Food and Drugs Inspector, Amith Perera, pilgrims are the biggest offenders when it comes to smuggling cosmetics. "Skin creams and lotions are mainly smuggled from India, Thailand and China and perfumes from West Asia. Some of these products don't even indicate basic details such as the manufacturer's name, country and address, manufacture and expiry dates and local agent. This makes it difficult for authorities to take action on the manufacturer or importer," he said. He said, regular raids conducted in Pettah, Borella and Wellawatte unearthed large quantities of smuggled goods and a number of traders have been prosecuted. 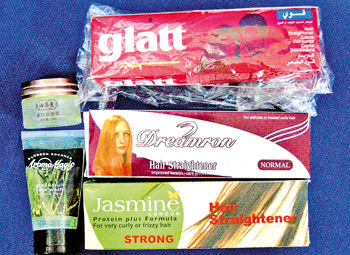 The smuggled goods also reach areas out of Colombo and are available in cosmetics, clothes and fancy item shops. Unfortunately their main customers are beauticians. In 2010, the Authority had randomly taken 53 samples of cosmetics from the market and found out that only 18 were registered with the CDDRA. Offenders can be imposed fines up to Rs.50, 000 or a six-month jail term in instances where the cosmetics are injurious to a person's health or if they have violated the Act that stipulates the selling of unregistered cosmetics an offence. Last year 10 traders were prosecuted for violating the Act. National Hospital, Consultant Dermatologist Dr. K. Sathgurunathan said many of those who seek treatment for cosmetics-related allergies, acne and pigmentation had applied face creams, foundations, toners, lipsticks, moisturizers, deodorants, aftershave and hair dye that had adverse reaction with their skin types. "It is important to be cautious when using cosmetics as one is when taking medicine. There are some cosmetics that don't mention even the ingredients nor indicate whether it causes allergic reactions therefore it's necessary to test hair and skin products before using them," he said, adding around six patients seek treatment daily for cosmetics-related mishaps. "Fairness creams has become a cottage industry in some countries. There are no regulations that govern these products and most do not mention even the ingredients. Most fairness creams contain strong skin lightening steroids and bleaching agents to whiten the skin. This is detrimental and damages the skin's texture making it vulnerable to skin-related illnesses like pimples, darkening of the skin, skin-allergy and disfiguration," he warned. Dr. Sathgurunathan said there are some who would consult a dermatologist to prescribe a cream that would make the skin glow being prepared to pay any amount but would ask for cheap alternatives when it comes to alleviate skin-related illnesses. He said, beauty parlours were mushrooming and some were even treating medical conditions such as acne. 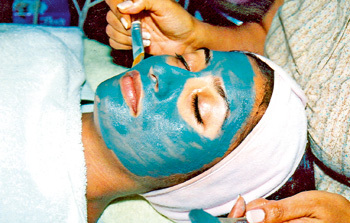 "Beauty culture is a speciality and beauticians should be qualified and trained. Unfortunately this is not the case most often than not," he said. Well-known beautician Ramani Fernando said heavy taxes imposed on imported cosmetics has resulted in baggage cosmetics flooding the market. "Salons using registered and original products do not have a big profit margin but we give the best to our clients. Today, anyone can open a salon as there is no regulatory body that registers a beautician, according to their qualification and the products used are not inspected," she said adding that some clients are not too concerned about what is being applied on their hair or skin.